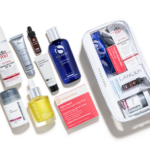 The Birchbox Limited Edition: Travel Ready Treasures Box is available now! Details: Free Stephanie Johnson Luggage Tag with qualifying purchase of a Limited Edition: Travel-Ready Treasures bag. Use code: TAG at checkout. Limit one per cart. Cannot be combined with any other offers. In order to return any item in your order, you must also return the luggage tag. Available only while supplies last. 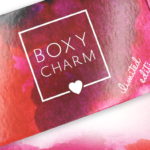 Does that cute Birchbox Dopp kit bag come with? Just a note that I love those Wander Beauty eye masks. I have dark circles and allergies (and long stressful nights) often give me puffiness and even red or dry patches too. These are some of the rare masks that give me a spectacularly noticeable difference. I quickly bought a whole box during the last BB sale after sampling. Ok, so I’m actually pretty stoked about this kit! I love the comb, the toothbrush & toothpaste, the shampoo & conditioner, the aluminum free deodorant, the cleansing duo, and the adorable bag. The gold eye pads look really cool, and my daughter loooooves sleep masks. All the rest is cool extra. Plus I used the 15FORYOU promo, and I had points, so I ended up getting this bag for more than $10 less. The promo blew my free luggage tag offer, but I just got super cute luggage tags from FFF. Lots of trips this summer, so I needed some travel sized goodies! If I didn’t have a shopping problem and already have tons of related items then this may be a win. I have two sleep masks that I just recently got from other boxes and I’m considering getting the Silk mask from the FFF edit sale. If I’m going to buy something I already have, I want it to be a better quality than I already have or it’s a waste because I will never use it. For $42, I don’t think it’s worth it. I kinda want it, but at the same time I want to pass. I’m torn LOL. Part of me likes this kit.. but, then part of me feels this kit isn’t as good as 2017’s fully packed. And thinking sorta lame they included a tooth brush and tooth paste. I get it’s for travel, but still just sorta lame coming from a makeup sub company. Also, it’s $7 more then last year. I liked last year’s much better. The items were more useful for me. I think it’s a pretty solid box of stuff you would need for a trip. Birchbox isn’t a makeup sub company. They make their money from their shop, which also sells a small selection of home items. I think what would make this box perfect would be to include a BB cream or similar, and have a few different shades available. I’d 100% get this for vacation! You’re absolutely right…they always look better when MSA reviews. I’ll pass for now though. I didn’t remember the 2017 Fully Packed box, so I searched on MSA for a review. There wasn’t one for that box, but I DID notice that last year’s limited edition boxes in general are SO much better than this year’s! Why does that always happen? Sorry for some reason I had thought last years bag was called fully packed. But, the title was actually Pretty Packed. Oh, thanks! Checked it out and yeah, it was better than this year’s for sure. Wow these boxes are more or less identical.